Ginger (Zingiber officinale) has been widely used in traditional medicine, and as raw material for cosmetics, beverages, and health functional foods. However, some adverse effects of ginger have been reported. In addition, the hot and pungent taste of ginger leads to reduced consumption. To overcome these problems, methods for the production of fermented, steamed (or steamed-dried), aged, roasted and beopje ginger have been developed. 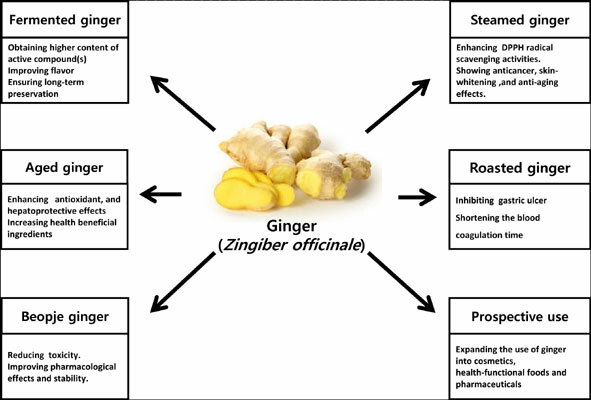 This review provides an overview and summary of new ginger processing procedures, including methods to reduce the pungent flavor of ginger, extend shelf-life, increase the health-functional compound content, and improve safety. These attempts might improve the consumption of ginger as well as prospective applications of processed ginger for food, cosmetics, and the pharmaceutical industry, also as discussed in various patents. Ginger, processed ginger, Zingiber officinale, alleviate toxicity, herbal medicine, subtropical regions.